Mortgage broker Samantha Brookes is trying to figure out how to get one of her clients out of a housing-fueled debt hole. The couple, a 59-year-old Toronto city worker and her husband, 58, have so much debt that they stopped making payments on the C$410,000 ($318,000) mortgage for their suburban home. They wanted to refinance but regulations imposed last year will disqualify them. In a few weeks, they won’t even qualify for an uninsured loan at an alternative lender as more rules come into effect. They opted for a third route: adding a second mortgage with an interest rate of 10.5 percent to pay off their debt. Their salvation came from a private unregulated lender, a move many other Canadians are making as the government tries to rein in a home-price surge that’s driven household debt to a record. But like a giant game of Whac-A-Mole, the risk to the financial system from tapped out borrowers is merely shifting — this time to a market where there’s no oversight from the country’s national bank regulator and new stress-test rules don’t apply. For the government, it may be a case of careful what you wish for. Anxious to prevent a repeat of the kind of taxpayer-funded bank bailouts that occurred in the U.S. after its housing crash a decade ago, the federal government has been moving to reduce its exposure to the mortgage-insurance market. Rules last year added a stress test for insured loans backed by the government. That sent more buyers to the uninsured space, where a 20 percent down payment is required. As of Jan. 1, these borrowers will also need to qualify at a rate two percentage points higher than their offered rate, a move which could lower mortgage creation by as much as 15 percent, Canada’s bank regulator has said. Earlier changes have already had a dramatic effect. Uninsured mortgages made up about three-quarters of new loans at federally regulated banks this year, up from two-thirds in 2014, according to the Bank of Canada. Roughly 90 percent of new mortgages in Toronto and Vancouver this year are now uninsured, in part because government insurance is forbidden on homes priced over C$1 million ($780,000) and prices have risen, the bank said. 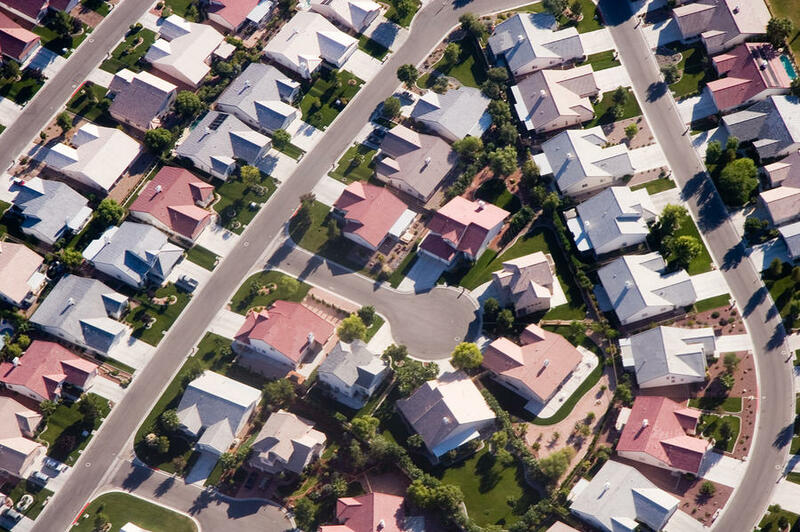 On the one hand, taxpayer risk has dropped as insured mortgage origination fell 17 percent in the second quarter compared with a year earlier, the bank said in its semi-annual financial system review. About 49 percent of all outstanding mortgages are now uninsured, up from 36 percent five years ago. 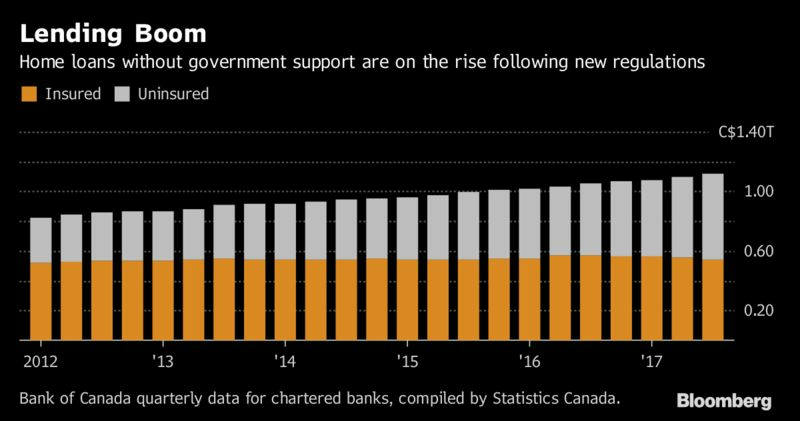 The credit quality of some of the loans at the big banks have also improved as borrowers buy less expensive homes, the Bank of Canada said. The rules, along with other measures such as a foreign-purchase tax, have had an initial bite — with Toronto house prices falling 8.8 percent from May to November and the average price of a home posting the first annual drop since 2009. Vancouver prices have reclaimed new heights after cooling earlier this year. But the risks to the financial system haven’t gone away. In the uninsured space, mortgages are increasingly going to highly indebted households and for amortizations for longer than 25 years, the central bank said. And like Brookes’s clients drowning in house debt, more borrowers are turning to lenders whose activities fall outside federal regulatory scope. These include credit unions and mortgage-investment corporations, pools of money from individual shareholders, which aren’t subject to the new rules, Tal said. Credit unions hold about 17 percent of uninsured mortgages, according to the Bank of Canada. Canada’s patchwork regulatory system also doesn’t encourage comfort, Tal said. Banks are regulated by the Office of the Superintendent of Financial Institutions, but credit unions and brokerages are overseen provincially. Mortgage-finance companies are semi-regulated, and MICs and other private lenders are unregulated. MICs currently make up about 10 percent of mortgage transaction volume, or 6 percent of dollar volume, according to research from Tal at CIBC said. Transaction volume will likely grow to about 14 percent under the new rules, and in the event of defaults in a housing correction, those MIC investors would be open to losses, he said. Sound underwriting is an important element in maintaining a strong and stable Canadian financial system and OSFI will continue to monitor the country’s housing and mortgage markets under the new rules, Annik Faucher, spokeswoman for Ottawa-based organization said in an email. Like her clients, Brookes said borrowers will get creative to get around the new rules. Options include companies like Alta West Capital, Fisgard Asset Management Corp. and Brookstreet Mortgage Investment Corp. or just a wealthy individual willing to lend at interest rates starting around 12 percent. Fisgard didn’t respond to request for comment, Brookstreet declined to comment while Chuck McKitrick, chief executive officer at Calgary-based Alta West said MICs are regulated by the country’s securities commissions and various real estate bodies. Despite the expectation that MICs will see more business, McKitrick said the big financial institutions will adapt to new regulations to keep lending. Shawn Stillman, a mortgage broker at Mortgage Outlet Inc., said banks could lower their mortgage rates so homebuyers would still qualify under the new stress-test rules. “The bank doesn’t care because they’re still going to make their fees and get their money,” Stillman said by phone from Toronto. Alta West predominantly lends to entrepreneurs and new Canadians, groups that typically have a harder time getting a mortgage at one of the big banks. Its rate of mortgages in arrears is about 2 percent, he said. That compares with about 0.2 percent at the big banks and about 0.4 percent for the credit unions, according to data compiled by the Canadian Credit Union Association. “People need solutions — it could be temporary, but at least they have a home over their head,” Brookes said.